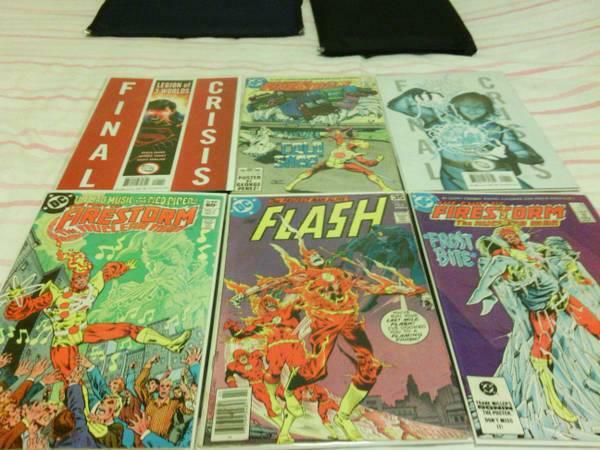 Selling (SET 2) of Comic Books of Flash/Firestorm/SuperBoy Prime Final Crisis. The Firestorm #21 Comic Book has First Appearance of Killer Frost. Which Killer Frost will be Featured in Season 2 of the Flash TV Series. Killer Frost (Caitlin Snow) and Vibe (Cisco Ramon) -- and more Flash characters are confirmed to be heading to Season 2. Likewise, in the comics, Caitlin Snow was a scientist whose body was accidentally fused with ice, which transformed her into Killer Frost. She's basically a "heat vampire" who can, for some reason, turn heat into cold. Her entire body is covered in ice and she can also create deadly ice projectiles and instantly freeze anyone she comes into contact with. Also Firestorm #20 also in the pictures has a cameo of the New Killer Frost. The Flash# 258 Comic Book has an Early Appearance of Black Hand who may Appear in Upcoming Episode of the Flash Tv Series latter on in Season 2,or the Suicide Squad upcoming tv series. Most of these Comic Books are in 9.4 Condition,and a few are in 8.5 Condition with New Bags/Boards. Selling them All for $15. Email me back if Interested, or you can Tex me. Also Adding 2 Exclusive Movie Film Cells from Fantastic Four: Rise of the Silver Surfer.